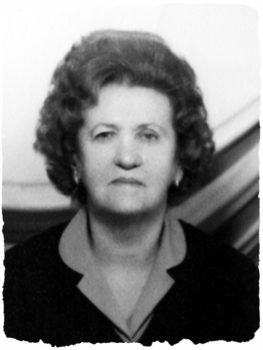 Skopje, Yugoslavia… 1943 – Bronia Bechar was born in 1939. Her father, Aaron, was in business with a non-Jew, Aleksander Todorov. The Todorov and Bechar families were close friends. In 1943, when conditions worsened for the Jews, Aleksander obtained new identity cards for the Bechar family and they made their way to the Albanian border. Upon reaching the frontier they became discouraged when they saw how well it was guarded and returned to Skopje (now Macedonia). On March 10, 1943, the Germans launched a major roundup of the city’s Jews. When Aaron and his wife, Rivkah, received their deportation order, they wanted to take Bronia with them. After much discussion, it was decided to leave Bronia with Blaga and Aleksander. On March 11, 1943, Rivkah and Aaron reported as ordered and were taken to a nearby internment camp. The Todorovs sent food packages and Aleksander visited them. However, the Bechars were deported to Treblinka where they were killed. Bronia, now named Christina, lived with the Todorovs as their daughter. However, the neighbors knew differently and rumors began to spread. Blaga Todorov let it be known that Christina was the offspring of a premarital relationship with another man. Bronia lived with the Todorovs throughout the war. After the war, Aleksander would send Bronia with money wrapped up in a newspaper to the office of the local Jewish communal organization. However, she was not allowed to tell them who she was or where the money came from. In 1948, the Communists arrested Aleksander, charging him with capitalist tendencies. Aleksander received a long prison sentence. Blaga took care of the family, which now included a son, Sergej. In 1952, Bronia found a note in one of Aleksander’s books: “Bronia Bechar shall remain with Aleksander Todorov until our return.” It was signed, Aaron Bechar. Shortly after finding the note, Bronia went to the Jewish communal offices and inquired about Aaron Bechar. She learned that she was Jewish, that the Todorovs had saved her life, and that her parents had perished during the Holocaust. Bronia kept this information to herself for six months. However, when a friend of Blaga’s saw her going into the Jewish communal offices, Blaga asked Bronia what she had been doing there. Bronia told Blaga what she had learned. Bronia became determined to rejoin her people and she left for Israel in 1952. Bronia remained close to the Todorovs until they died.